There are two types of arrowroot. One is the small, whitish bulbs like a small, yellow onion which is very popular during Chinese New Year because this small arrowroot makes good chips, very much like potato chips. You can find my recipe for making arrowroot chips for Chinese New Year over here. 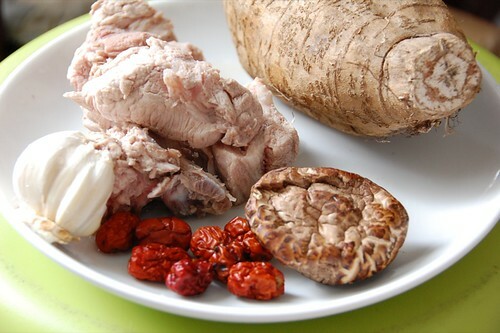 However, there is another huge root vegetable, very much like a big sweet potato which is also call the arrowroot. I bought one today because I am curious what it tastes like. 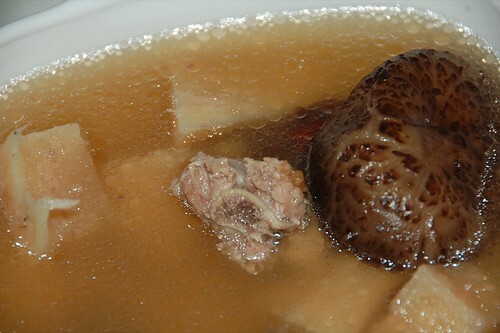 Like all root vegetables, it is best slow boiled with pork ribs, red dates, dried shitake mushroom and garlic to make a nice soup. Bring water to boil and put in all the ingredients. Let the ingredients boil for about five minutes. Turn down fire. Let simmer on low fire, in covered pot for about 1 hour. Season to taste. Here are what I used. The arrowroot has very thick skin. After removing the skin, I cut them into cubes. It has very strong smell of the earth and smell ‘green’ too. 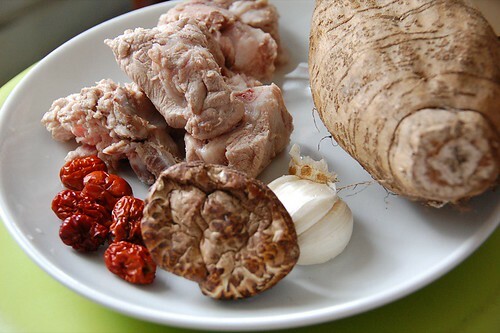 Luckily, after cooking, it gives off a pleasant fragrance, very much like lotus root. In fact, the soup tastes exactly like lotus root soup, earthy without the ‘green’ smell. The root vegetable has very coarse fibres and I don’t think I like eating it. It is hard even after being cooked in my pressure cooker. However, the hearty soup is tasty. Do give this root vegetable a try the next time you find it in the market. Kaz – No, this is oblong. In Hokkien, we call it alulut. Hahaha. But there is arrowroot in powder form too.